There isn’t anything I like to cook more than soup. When I do, I feel like a composer, working to harmonize flavors in this balanced and specific way. Also like I just like soup. Because it means I can dip a crusty baguette in it. 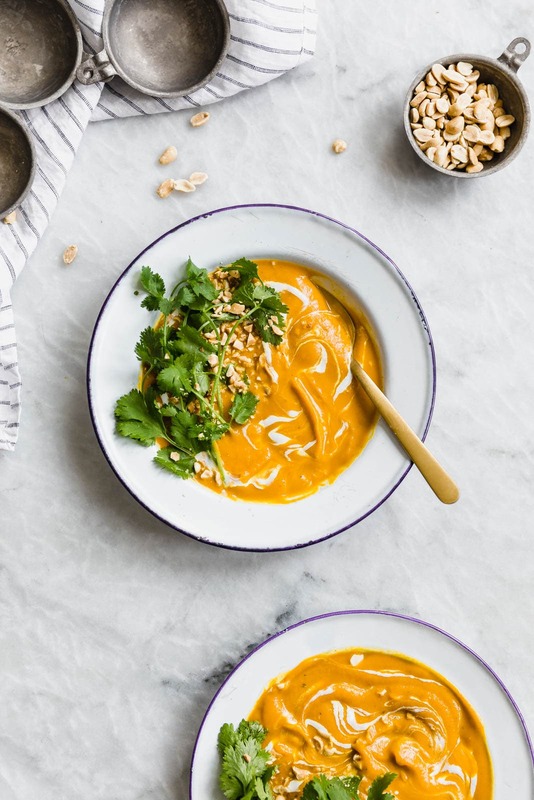 This Golden Turmeric Carrot Ginger Soup is the absolutely perfect soup in which to dip crusty baguettes. It’s thick and vegetal, and bursting with flavor. The turmeric imparts a warmth, plus it’s apparently anti-inflammatory. So that’s good. I feel like carrots don’t get enough credit. They are so tasty, but get overshadowed in the wintertime by squashes and all that. But vegan carrot soup is where it’s at. Plus, if you eat enough carrots your skin will turn just slightly orange, which is great in the winter because it looks like a tan. I’m not even joking. It’s called carotenemia. Look it up. I’ve seen it in person because our old neighbors have the cutest baby who was obsessed with carrots, and he looked tan all the time. So if nothing else, eat this soup to become tan. Once the veggies are all prepped, this vegan soup recipe comes together in about an hour. If you’re planning on making this during the week, you could always dice the carrots and onion beforehand and store them in air-tight containers until you’re ready to start cooking. Also, skip peeling the carrots to save time. Buy organic if you plan on leaving the skin on and wash the carrots under warm water before dicing them. To actually make this soup, you first need to sauté the carrots until fork-tender (about 10 minutes). Then, you’ll add in the diced onion and continue sautéing until they’re translucent. Stir in the turmeric and ginger and cook for a minute or so to wake up those flavors (this really does make a difference!). Then, you simply need to add in the liquids and leave the soup to simmer for a good 30 minutes to an hour. If you have the time, I’d let this soup sit on your stove for longer to deepen the flavors even more. Now, a few notes about switching up this recipe. 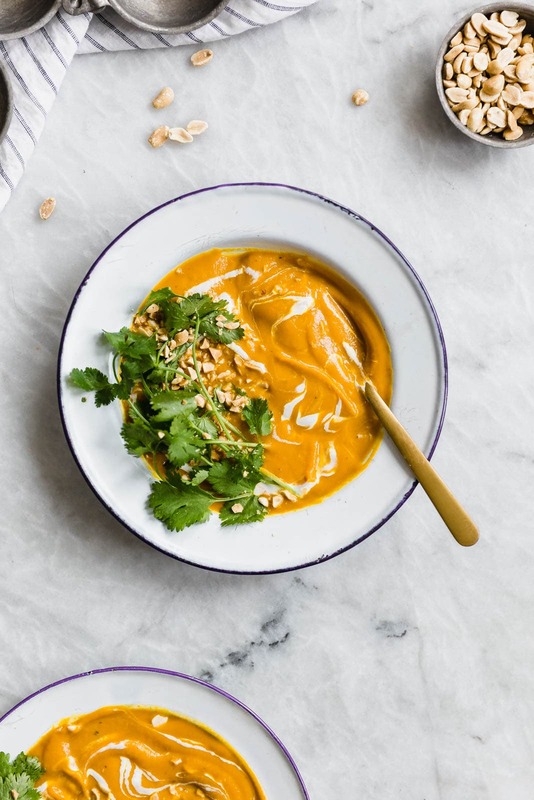 I used light coconut milk in this carrot ginger soup recipe, but you could use full-fat for an ultra creamy soup. I also chose to puree my soup using an immersion blender, but you could also (carefully) ladle the soup into a blender or food processor to achieve a similar effect. Or you could skip blending this soup altogether! If you dice the carrots and onions finely enough they’ll get nice and mushy. Your soup will be slightly chunky, but not horribly so. 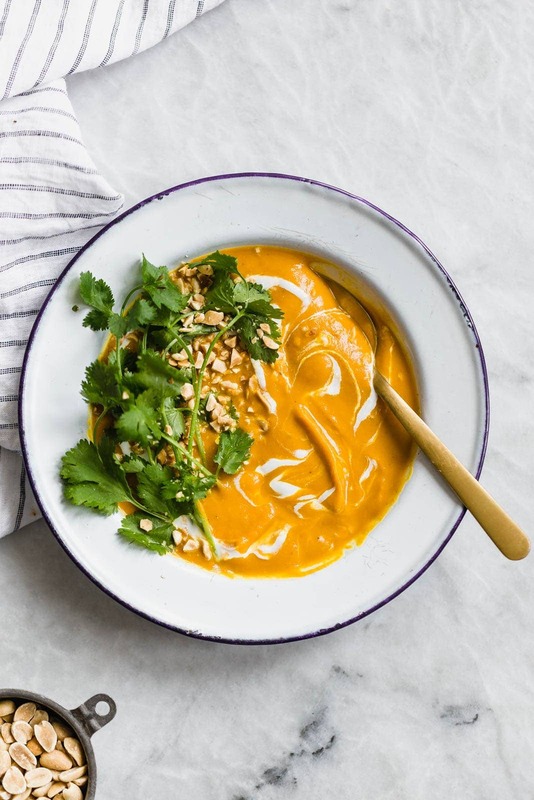 To seve this soup, I topped it with cilantro, red pepper flakes, roasted peanuts, and coconut cream, but you can prepare your soup as simply or elaborately as you want. Heat a large caste-iron pot over medium heat. Add in olive oil and carrots, sautéing for 10 minutes, or until the carrots are fork-tender. Add in the onion and salt, and sauté an additional 5-7 minutes, until the onions are translucent. Stir in the turmeric and ginger and cook for 1 minute. Add in the vegetable stock, coconut milk, and maple syrup. Boil, then turn heat to a simmer. Cook for 30 minutes to an hour (the longer you cook, the deeper the flavor will be). Use an immersion blender to blend the soup. For a finer soup, strain the blended soup through a sieve or fine mesh strainer. Cook for an additional 30 minutes. 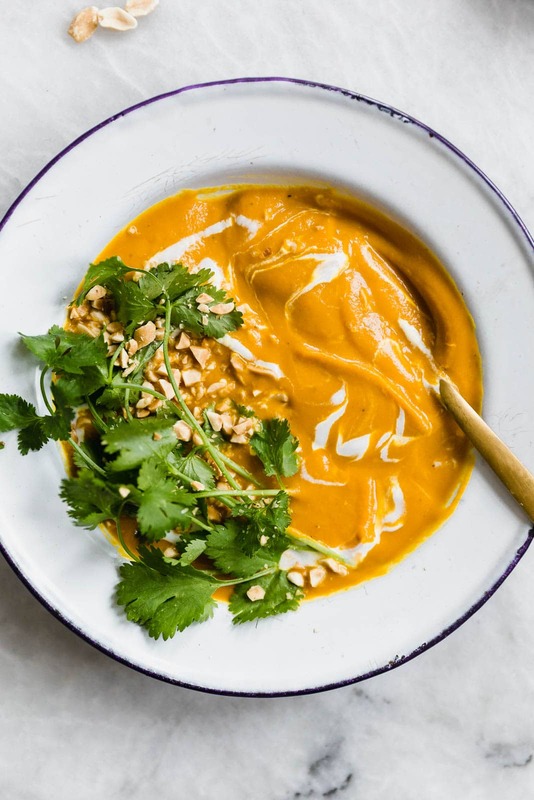 To serve, season to taste with salt and pepper, then ladle into bowls and top with cilantro, chopped peanuts, coconut cream, and red pepper flakes. I love love making soup so much! It’s one of the things I feel like I can wing it on without totally messing up 🙂 This seems like a perfect winter time healing soup! Thanks for sharing this eye-catching beauty of a soup, Sarah! It looks amazing! Fabulous! A yummy winter soup! Approximately how many 1 cup servings does this make? I’ll probably just double this and freeze some, but I’d like to know how many cups the recipe makes. Thank you! This soup looks amazing! Perfect for any night of the week! gorgeous! love all the flavours in this soup. carrot and ginger is one of my fav combos for soup! and once again, gorgeous pics! Oh does this soup need to happen!! Looks so thick and delicious! Perfect comfort food on a cold night!